The baseball preseason has begun, spring is almost officially here, and best of all, the March issue of Digger has arrived! 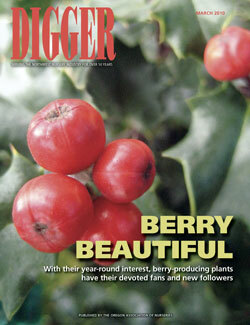 This month’s main plant feature (PDF) is on berry producing plants, which add beauty and encourage wildlife. We also have an article on “Defending your ground” (PDF) – meaning, the smart use of cover crops. And finally, it’s time to meditate and study “Kaizen and the art of softwood propagation” (PDF). Learn how one nursery adopted Lean production techniques to streamline production, lower costs and reduce stress for employees. Are you getting Digger? It is mailed free to qualified nursery industry professionals. Subscribe online, or call Debbie at 503-582-2004 to be added to the mailing list. Also, you can check out our back archive of Digger articles here. If you want to advertise, here’s the information you need. To learn more or sign up, contact Chris Sweet at 503-582-2012 or csweet@oan.org.